Business Insider/Mary HanburyMacy’s Backstage could cannibalise sales at Macy’s, analysts say. TJ Maxx‘s parent company, TJX Companies, on Tuesday reported stronger-than-expected sales numbers in the second quarter. Analysts say that new competition in the off-price market, such as Macy’sBackstage concept, is not affecting TJ Maxx’s sales. 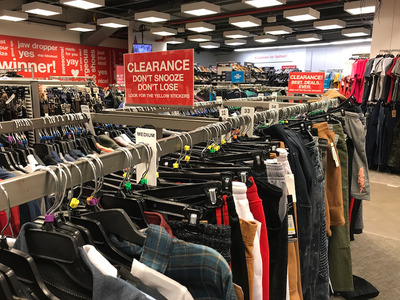 “Fortunately, we have found that Backstage is better at cannibalising Macy’s own sales than drawing sales away from TJX,” Neil Saunders, the managing director of GlobalData Retail, wrote in a note to investors on Tuesday. Macy’s is going all in on off-price retail. This year, the department store is expected to add its Backstage concept to 120 stores, bringing its total to 160 Backstage locations. Gennette said that the company was closely monitoring the 40 stores that added Backstage sections in 2016 and 2017 and that it had seen positive growth in Backstage there. Despite this investment, it doesn’t seem to be putting much of a dent in the sales of one its biggest competitors in the space, TJ Maxx, whose parent company, TJX Companies, reported a 6% increase in same-store sales for the second quarter of 2018, surpassing Wall Street’s expectations and sending its share price soaring on Tuesday. Same-store sales for Marmaxx – TJ Maxx and Marshalls – were up 7% in the quarter. In July, GlobalData Retail surveyed nearly 3,000 consumers who had shopped at Macy’s Backstage over the past year, asking them which store they had shopped at less as a result of spending more at Macy’s Backstage. The largest group – 39% of respondents – said Macy’s, while 10.3% and 7.9% said they shopped less at TJ Maxx and Marshalls. While it makes sense that department stores like Macy’s and Nordstrom would want to imitate the popular off-price model, they have one major disadvantage while operating in the space: Their off-price stores have to coexist with their full-price stores, which also offer discounted products, potentially leading to brand confusion for customers and vendors. When Macy’s announced it would roll out Backstage sections to its existing stores in 2016, its CFO at the time, Karen Hoguet, assured investors that the new store model wouldn’t cannibalise sales from its full-priced stores because it had a separate buying team and different vendors. “The deck looks stacked against them,” a group of Morgan Stanley analysts said in a note in May 2017. The analysts wrote that off-price stores such as TJ Maxx have a structural advantage over department stores because they have large vendor bases built up over decades and some products are made specifically for them by certain brands. Macy’s Backstage does have a separate buying team that sells a mix of products, from the current and previous season, from new and existing vendors. But a representative for the retailer confirmed in June that Backstage also sold some overstock from its other full-price stores, potentially making it a confusing shopping experience for the customer.